Wondering what Shakeology meal replacement shakes taste like, but afraid to take the plunge for a full 30-day supply in case you don’t like them? Some people have discriminating tastes and are always afraid to try something new – because if they don’t like it, they can’t consume it. We understand this problem, and so we’re offering Shakeology samples, so you can decide whether or not the flavor will work for you before you order the full 30-day supply of our meal replacement shakes. 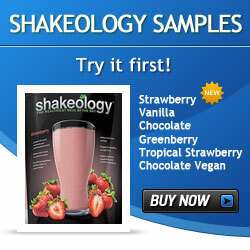 The Shakeology sample packages are sold through a Beachbody coach for your convenience. Once you place your order, you will receive a confirmation email and your sample will be mailed to you within 2 business days. Keep in mind the meal replacement shake samples are only designed to show you what the product tastes like. You will not experience the full health and nutritional benefits of Shakeology by drinking it just once or twice – like any other health product, Shakeology typically needs to be consumed for at least two months before you start noticing the health benefits. So once you try a sample and fall in love with the taste – come back to order your 30-Day supply so you can start experiencing the health benefits of Shakeology! Did You Know Shakeology Has a 30 Day Money Back Guarantee? While you can try one sample at a time to decide if you like Shakeology, you should also know that Shakeology is risk-free. Shakeology offers a 30-Day, money back guarantee and a “bottom of the bag” guarantee. This means you can return the unused portion to Shakeology for a refund (less the shipping costs); or if you decide after consuming the full 30 days of Shakeology meal replacement shakes that it just isn’t for you – you can still request a refund. Why wont my submission go through? Don’t know what I am doing wrong. Are you getting an error? The form redirects to paypal after you submit it to pay for the samples. Do you still have samples for sale? Sure do! All 4 flavors ready to go! Hello. Do you still have samples of all four favors? Yes I have all 4 in stock. how long does it take to recieve? We normally ship out the samples next day via USPS. It usually takes 3-6 days depending on your location. We provide a USPS tracking number on all shipments. would i be able to purchase more thru you after or should i just go to the beachbody and purchase there? i just ordered the samples, please tell me it is the new chocolate flavor. Are these samples still available? Thank you! Yes, we have all 4 flavors in stock at all times! Cool, thank you. I will place an order! Your package has been shipped, I will deliver the tracking # once it is available in the system. Thank you sir. Sounds great! Anxious to try it and see if it is about to become a part of my daily routine. I “could” but I would have to look into shipping costs first. Also, Beachbody does not ship Shakeology to the UK, so if you wanted a full order you would not be able to get one directly from Beachbody. Feel free to email( info [at] shakeslim [dot] com) me how many samples you want and your address and I will get a quote on shipping and let you know. Your samples ship out tomorrow! Before I order, i wanted to check to see if you still have samples? Yes, we have all flavors in stock. I received your order and it will go out Monday. Can I use beachbody giftcards for this order? Unfortunately, you can only use BB Gift cards on Beachbody.com and not this site. Hi: I see the dates on here are really old, just checking to see if you are still doing samples? If so, what is the cost for the full price if you decide you like and order it? Yup, we do a quite a bit of samples every month. Where are you located, US or Canada? That would determine the price based on your location. Just ordered a few different samples very excited to try them out. I was given vega shake by a fitness friend who said it is very similar but it tastes really yucky … I did some research and the benefits of shakeology isn’t comparable (shakeology I have heard is amazing) from what people are saying so extreamly excited to try these out and put in into action in my daily life. You should be excited, it’s GREAT stuff. Will touch base with you in a week or so to see what you think. Yes we do, we have all flavors and soon will be getting the new Mocha Flavor.